A PSL Blank on the Left, and a Receiver on the right. Childers Guns has the most complete blanks possible with the approval they received from the ATF in 2018. 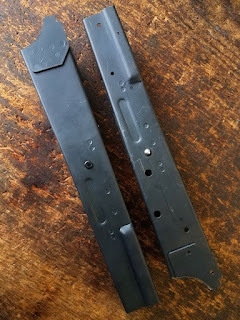 The only differences between a blank and receiver are the 6 FCG holes for the hammer, trigger and selector, the US manufacture markings, and serial number. Receivers must be shipped to an FFL holder. For a blank, the customer must drill these holes on their own. Manufacturers markings and serial number are not present, and they can be shipped to their door.